Download PDF version of this article: Click here. Gone are the days when the choice of a profession was either a doctor, lawyer or engineer. Today, life and career coach Anthony Hadeed, chief executive officer of YourLifePurpose Limited (Helping You Discover Your Purpose in Life), says that with psychometric testing “there are 840 categories of careers in the US Department of Labour database under which there are multiple careers, so there are thousands of careers that young people have to choose from, so it is understandable that young people are confused because of the proliferation of career choices”. Hadeed, a Jerningham Gold Medalist from St Mary’s College in 1979, initially wanted to be a medical doctor. “My father died when I was 15 but I always wanted to help people, and as a teenager I was always concerned about people’s suffering,” Hadeed told Sunday Newsday. However, as the seventh of eight children and with the A level results late that year, his mother could only afford to give him a ticket to Canada and one term’s tuition. Hadeed was 17 when he entered Queen’s University in Kingston, Ontario, and had started to study the sciences in a pre-med course, when his mother called to say that he had won an Open Science Scholarship and the Jerningham Gold Medal, having topped the A level exams in the country. Meanwhile, he had been accepted to study medicine at both the University of Edinburgh in Scotland and the University of Manchester in England, but gave up his dream to pursue medicine because he had no one to take him to the UK. He was still recovering from the culture shock of leaving Trinidad to go to Canada, and could not endure another culture shock in going from Canada to the UK. Canada was no longer accepting foreigners in its medical program and so Hadeed decided to become a professor instead and remained in Canada. By 1983, he had obtained a first class honours Bachelor of Science degree in physics, and by age 22, in 1984, had obtained a Master’s Degree in High Energy Physics from the University of Toronto. “I began of pursuing a doctorate in physics at University of Toronto, and after two years of doing research and teaching physics, I found out that Canada was not hiring professors at that time. So I came home in 1986 and tried to get a government job to pay back for my scholarship, but they couldn’t find me a job in my field,” Hadeed recalled. In 1987, Hadeed returned to Canada and kept searching for a job, when he met a Guyanese national at a cricket game. “He started to talk about his C programmer that was leaving in two weeks at Crowntek, owned by CrownEx in Canada, and asked, ‘Would I take the job of C programmer?’ This was my first entry into the world of information technology,” said Hadeed, who quickly did crash courses on his own and taught himself C programming in two weeks. His only experience in IT had been a half course ten years before but by September 1987 he was employed as a full time programmer analyst. It was at this point that Hadeed gave up the dream of becoming a professor in physics. At the end of 18 months, Hadeed transferred to systems engineer, which he said “was more suited to my personality, as programming was too isolating. I am a people person and so this gave me an opportunity to help people, and as simple as it seems I was indeed helping people”. Within a year he was promoted to manager of the systems engineering group at Crowntek. 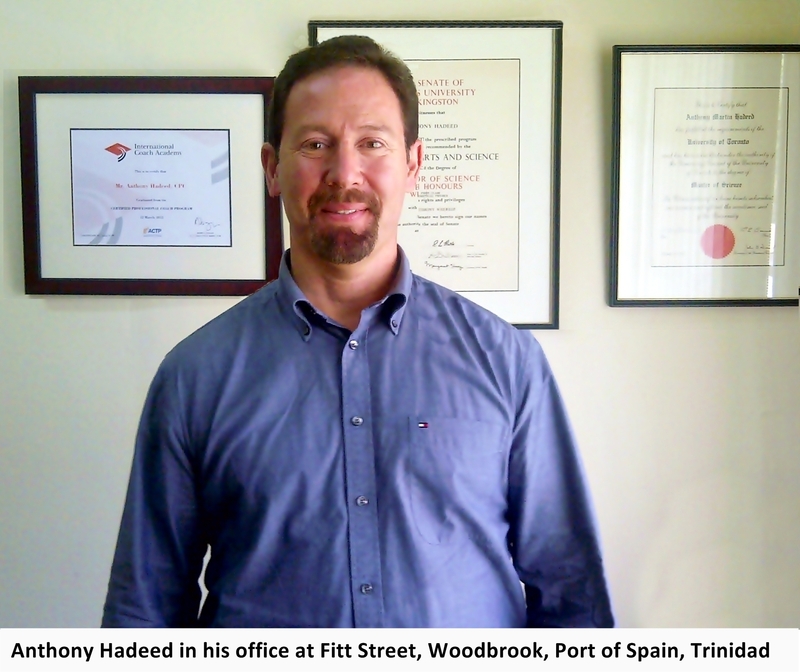 After eight years working up the chain of command with Crowntek/GE, Hadeed started his own business in IT – AMH Communications Inc, Toronto, again working at something that was not his passion. Hadeed visited John Schurmann, a life coach in Toronto, and through the use of Psychometric testing (derived from psychometrics, the science of measuring mental abilities and processes), Hadeed was guided to try careers like guidance counselor, medicine, youth counseling and medical technician. “I realized if I started studying medicine at age 47, I might be a medical doctor at 56, that much older for studying, and the stress of internship. But with one or two years study as a “coach” I could help people to be proactively happy, as if I catch them young they will see a job as a hobby, and I was always comfortable working with the youth,” Hadeed said. “The good Lord was leading me to guide them into the right path, almost like preventative medicine, so I would at the same time fulfill my childhood dream in a different way. I saw the effect on my health and life from not doing what I really wanted to do, and knew the dangers of not speaking up and going into the wrong career … I wanted to do medicine but just didn’t pursue my dream strongly enough.” Hadeed completed a research paper for his coaching certification and determined that three out of every ten people suffer from health or family problems because they are not living a purpose driven life, a life with the right career. He noted that eventually this affects your health and you take it out on family, as you keep the unhappiness within you and it causes health problems. It is because Hadeed once again gave up his previous dreams that he is able to pick up when young people are not in touch with their emotions. He said if one’s emotional intelligence quotient (EIQ) is low, you cannot assess your own emotions and will be unable to assess other people’s emotions because you are not emotionally perceptive. He noted that an emotionally well balanced person is someone who can show reasonable ranges of happiness, anger and sadness, without going from one extreme to the other, as no emotions and extreme emotions are both unhealthy, somewhere in between is healthy. With a high scoring EIQ, an emotionally well balanced person has a much greater chance of being successful in his/her career, family and society, “it’s a modern indicator of success in life today, and businesses are aware of this, and schools are becoming aware, that an early indicator of a child having problems and shutting down, means they are not in touch with their emotions”. Hadeed realized that career guidance is one of the weakest points in the global education system, went online and eventually got certification as a certified professional coach, specializing in life coaching and career coaching with the International Coach Academy, a worldwide international company. A year ago, well into his 40’s, Hadeed became nostalgic and the extremely spiritual man felt God was guiding him back home. Eighty percent of his business is career coaching and the list of psychometric assessments offered to clients is very extensive and covers a wide spectrum of assessments in the categories of career, personality, attitude and lifestyle, intelligence and relationships, to recommend careers which suit their personality. The other 20 percent of his business is life coaching, which includes four coaching aspects — physical, emotional, mental and spiritual. If something is missing in a client’s life, Hadeed helps them to get a better balance and avoid a crisis. Because health problems can follow not living a purpose driven life, Hadeed stressed it is incumbent upon the Ministry of Education to focus some efforts on career guidance in a more structured scientific way, such as starting psychometric assessments for students from form three. It should not be all about academics, he said, career guidance is an integral part of developing a successful individual, which in turn would bring tremendous returns for the citizens of this country and their families, if they lead purpose driven passionate lives through their careers. He said, however, that to do so, persons must get their career right and have the courage to make that change at whatever age, preferably before going to university. You have an impressive background and I think you are well suited to help others. I have two daughters who are 20 and 17 years of age and would like to have them properly tested for careers where they are likely to be happiest and most successful. Can you help in that regard? I may be reached at earlngeorge@aol.com.